On September 10, 2005, Monthly Review received an article chronicling the emergence of a new state in the liberated districts of Nepal. Since the author (Comrade Parvati) is herself a Nepali revolutionary and underground, we were not able to engage in the usual back-and-forth editing process. Therefore we present the piece with very slight editing as a document, accompanied by an introductory overview and some explanatory notes to the text by John Mage, a member of the informal Monthly Review editorial committee. Nepal lies on the south side of a five-hundred-mile-long section, east to west, of the Himalayan mountain range. China (Tibet) is its northern neighbor, and on the east, south, and west Nepal is surrounded by India (Sikkim, Bihar, and Uttar Pradesh). Nepal’s width north to south averages about one hundred miles—from the Himalayan ridge and the highest point on earth (Mt. 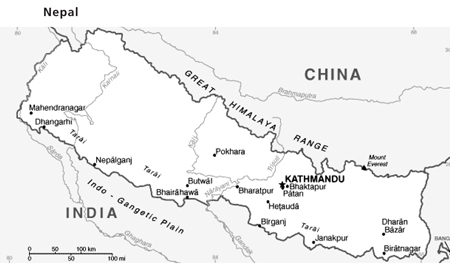 Everest, at 29,035 feet) down to a thin strip of the Gangetic plain (the Terai), where Nepal’s second largest city, Biratnagar, is less than 300 feet above sea level (see map). The hills between the high Himalayas and the Terai constitute by far the largest part of Nepal. In Nepal a hill can often be more than 10,000 feet high. Though the territory of the Terai is but a quarter of the hills in extent, the population of the Terai is almost as numerous as that of the hills. At the center of the hill country is a large fertile valley at an altitude of a bit over 4000 feet, the bed of a prehistoric lake. The valley contains the urban center of the nation. Here are the three adjoining cities of Kathmandu, Patan, and Bhaktapur, the central government, the leading educational, medical, and cultural institutions, and almost all of the nation’s traditional political and cultural elite. But at most 15 percent of Nepalis live in the valley and in all other urban centers combined. Nepal was united under a Hindu monarchy in the latter part of the eighteenth century. Within the united state was vast diversity, with large parts of the country inhabited by autochthonous ethnicities with varying languages, religious traditions, and patterns of cultivation and land ownership. A narrow stratum from among the high-caste Hindus commanded the army and administered the state. They appropriated the economic surplus as taxes, labor services, and rents, and established clientele among the various ethnic groups. These semi-feudal relations have persisted until yesterday, and are constitutive of the monarchy. Given the formidable barrier of the Himalaya, the foremost external influence upon Nepal has always been from India. At the start of the nineteenth century the recently unified Nepal fought a war with the British, who at that time ruled India. The war was terminated by treaty in 1816, leaving Nepal formally sovereign but dependent on the British Raj. The ruling feudal families provided hill peasant boys from the various autochthonous ethnic groups as soldiers of the British Empire, for whom they were paid so much a head. These were the world famous Gurkhas. After Indian independence, the new rulers of India sought to replace the British in exercising a semi-colonial control over Nepal, with mixed success. In more recent years the United States has openly and covertly intervened in Nepal, most visibly with advisers to the Royal Nepal Army. A revolution in Nepal has, in its tenth year, now triumphed in more than 80 percent of the country. Its immediate goals have been the destruction of the remaining semi-feudal relations in the countryside and the overthrow of the feudal monarchy in the center. The first goal has been achieved, and the second is in sight. The revolution’s longer-term goal is the construction of a new democracy, and the accompanying article addresses its progress to date. These processes have been at work in Nepal as well. The dominant traditional agricultural sector has remained undeveloped. Nepali capital, impotent and subservient to Indian capital, has created no alternative sources of employment. Unemployment and underemployment are at levels among the highest in the world. The only alternative for Nepali peasant youth driven from their homes on the land is to chase the wretched opportunities available to the precarious urban classes in India, or their equivalent in Nepal. Many young men and young women in the hills have extremely bitter personal experience of this reality. One result is a readiness to consider a revolutionary attempt at self-determination and liberty, even at the risk of death. For two generations from the founding of the Communist Party of Nepal in 1949, a Marxist analysis of the process in which Nepal is caught has circulated from one end of the country to another in all castes, tribes, and classes, the high-caste Hindu Brahmin and Chhetri not least. Given the popular demand for a revolutionary solution to the realities of growing immiseration, periodic waves of repression within the country, and divisions in the world communist movement, the Communist Party of Nepal did not long remain united. Communist party organizations arose, divided, and multiplied. Many party leaders were bought off for the usual reasons and in the usual ways. The old state had an invaluable, skilled, and experienced administrative corps, able to be flexible tactically so long as the fundamental semi-feudal social relations were reproduced. Tribal areas were granted extensive self-government, and much of the country was ruled (as it had been for centuries) by the local big guys with occasional assistance when needed from the national government’s police force. A mass uprising in 199091 resulted in a democratic monarchy, legal political parties, elections, and a parliament, but in fact achieved only a slight change in the old state. The army and administrative corps remained in the hands of the same feudal elite. The surplus from the countryside and the deep slices appropriated from foreign aid now had also to support the leaders of the top political parties, who constituted an unwelcome addition at the table. The revolutionary uprising began in 1996 focused on the Rolpa district, the poorest section of the hills. It met a response of the utmost brutality by the regime’s police (the so-called Operation Romeo and Operation Kilo Sera). But given the combination of the desperate circumstances facing the youth in the hills, a widespread Marxist consciousness, and revolutionary leadership, the police terror campaign united the community in self-defense and spread the uprising. The then King Birendra kept the Royal Nepal Army (RNA) out of the confrontation and opened negotiations with the revolutionaries. This course was deeply upsetting to the then Hindu nationalist Bharatiya Janata Party (BJP) government of India, and yet more so to the global strategists of the U.S. empire. The revolutionaries, having survived the series of murderous police assaults, in October 2000 attacked and wiped out a major police post located in Dunai, the district town of Dolpa District on the far side of a massive ridge from their base area. With the assistance of the local population the revolutionaries were able to bring many hundreds of armed fighters over single-file mountain tracks, and yet take the police by surprise. Dozens of political prisoners were liberated from the prison across the river from the police post. An army post was located only a few hours’ walk upstream, but the soldiers did not come to the rescue of the universally hated police. After Dunai and other successful actions in early 2001 that removed the police presence from ever-wider areas, it seems clear that the intelligence and security agencies of India and the United States decided to act. On June 1, 2001, King Birendra and his entire immediate family were murdered. A story was given out that the Crown Prince, drunk and on drugs, had murdered the entire family and then killed himself because he had not been permitted to marry the woman he loved. Except that he did not die immediately, and the surgeon who operated in an unsuccessful attempt to save his life said his blood tests contained no evidence of alcohol or drugs. For a fuller account of the context of this crime see The Letter of Dr. Baburam Bhattarai on the Palace Massacre in Nepal, https://monthlyreview.org/0601letter.htm. The only members of the royal family to escape the slaughter were the current King Gyanendra who was not in Kathmandu, and his son the current Crown Prince Paras who emerged from the scene of the bloodbath without a scratch. Within months the Royal Nepal Army, now equipped with U.S. communications gear and advised by U.S. soldiers, was engaged in combat with the youth in the hills. The U.S. plan has been to bring the leading parliamentary political parties into alliance with the Palace better to carry out a war of extermination in the hills. But the underlying refusal of the elite who command the army and dominate the administrative corps to give up a significant share of their spoils has served to frustrate the U.S. scheme. And despite the U.S. arms, equipment, and advisers, the revolutionary upsurge has spread to cover the country. The communist parties did not escape unscathed from the corruption of the declining old regime. In particular, the main communist parliamentary party, the Communist Party of Nepal (United Marxist-Leninist) (UML), found itself to be the home for some corrupt careerists. A cynic might say that not a few of its leaders were lucky to avoid the moral crisis they would have faced had the old regime more resources to dispense. Some, to their shame, actively supported the Royal police and the U.S. trained, advised, and equipped RNA in their murderous campaigns against the revolutionary youth in the countryside. Yet others, in particular the students affiliated with the UML, bravely confronted the old regime’s police in the streets of the valley. Most of the leaders of the various communist parties and organizations that did not participate with ministers in the national government in the post-1991 parliamentary monarchy era nonetheless argued against commencing armed struggle. Pessimistically, and with undoubted personal honesty, they claimed that the bloodshed and suffering likely under the conditions prevailing in 1996, both in Nepal and in the world, required that a revolution not be attempted (or, as some said, should be postponed). The most committed revolutionaries grouped in the Communist Party of Nepal (Maoist) (CPN[M]) went ahead and risked their lives, assessing correctly that the best, bravest, and brightest of Nepal’s impoverished youth, male and female alike, were more than ready for armed revolutionary struggle. The leadership of the CPN(M), whether in hiding in the areas still controlled by the RNA and at perpetual risk of torture and death, or sharing the simple and harsh life of the peasant population in the liberated base areas, has struggled to preserve and extend an open inquiry and debate within the party on the key questions of theory and practice presented by the revolution in Nepal. Comrade Parvati is a member of the politburo of the Communist Party of Nepal (Maoist). Her voice merits the closest attention of every Marxist and every friend of Nepal. 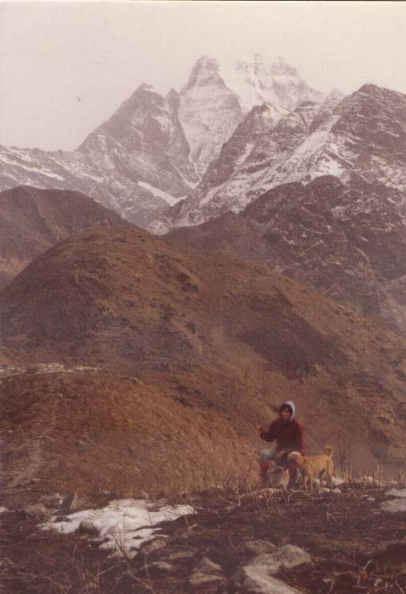 John Mage on the path between Ogaryana and Chetikhara in Rukum District, Nepal, April 1979. Above is Sisne Himal (19,430 feet).